2016 has started with a bang starting with the successful kickoff for the demolition of the apartments. Some have asked how to share some of the videos seen from us lately. To view the video and photos of the demolition event you can check them out at: www.liftorlando.org/demolitionkickoff. We've placed the 1 min. version of the Purpose Built video that aired on national television during the Citrus Bowl on the home page of the LIFT Orlando website for people interested in the quick intro to LIFT. Just click on large image of the West Lakes Apartments. Finally, our About page has the longer 7 min. introduction to LIFT Orlando. Or, click through them here, in the slider to the right. 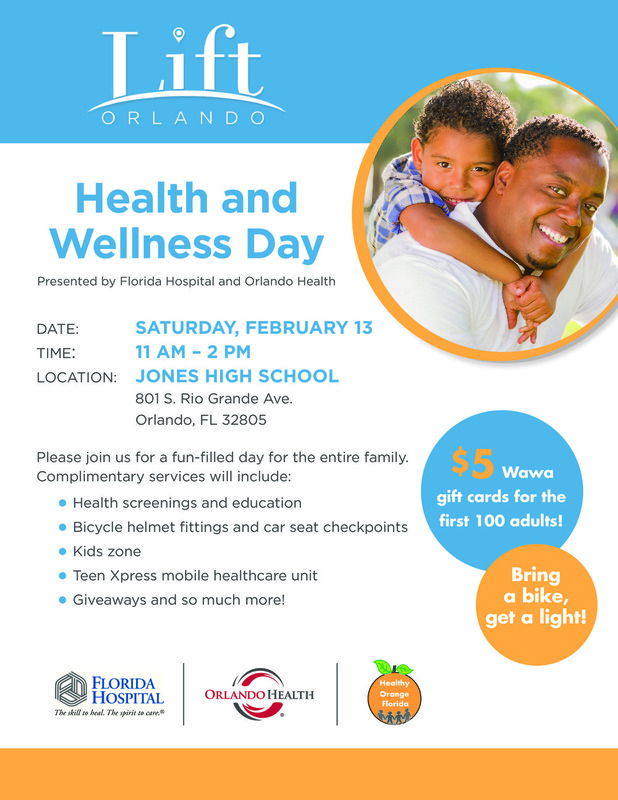 On Saturday, February 13th we hold our first LIFT Orlando Health and Wellness Day presented by Florida Hospital and Orlando Health with the goal of engaging families in the LIFT Orlando footprint in a day of fun with great health education and services for the whole family. Families in the Communities of West Lakes and throughout 32805 are invited to participate. The event will be hosted by Jones High School. The LIFT Orlando Health and Wellness Day will be a day of health and laughter for the entire family. In addition to Giveaways, a Kids Zone, and a $5 Wawa's gift card for the first 100 adults we will be offering health screenings, education and much more. On February 23rd the residents in the Communities of West Lakes will host our second Jobs Partnership, LifeWorks class at Orange Center Elementary. The 12-week program challenges and inspires participants to break out of mediocrity and despair by preparing for careers through the coaching and soft skills training that can give them an edge in the marketplace. The LifeWorks training course is a great first step toward finding and working a job with greater rewards. In fact, LifeWorks has helped more than 1,600 people in Central Florida improve their attitudes and beliefs about work, as well as given them access to resources and networks that aid in getting them on the right career path. Past students have gone on to find better employment and even further their education. To sign up or volunteer as a mentor, job counselor, career coach or employer, visit: www.jobspartnershipfl.org. Please join us on March 3rd as we celebrate and support these schools. LIFT Orlando issues an $80,000 matching gift challenge to benefit the Nap Ford Community School Fundraiser at the Citrus Bowl to be held on March 3rd, 2016. Dr. Jennifer Porter Smith and members of her team at Nap Ford make up the operational leadership for the new Legends Academy Charter School in the LIFT Orlando school pipeline, along with Frontline Outreach, Orange Center Elementary and Jones High School. On this night LIFT will announce its broader hopes and plans for education at these schools. The Orlando MINI Open presented by Roetzel & Andress, the primary fundraising event for the Florida Citrus Sports Foundation, returns to the sideline clubs of the Orlando Citrus Bowl on Wednesday, March 9. The MINI Open is a miniature golf tournament in the style of a major tour event on a pair of 18-hole glow-in-the-dark courses inside the Citrus Bowl stadium's RP Funding Club spaces.Guests will enjoy a spirited round of golf, premium food and beverage along the course and an exclusive silent auction items including sports memorabilia, experiences and other special items. Proceeds from the event directly benefit our charitable efforts in the community through the FCSports Foundation, including the free FCSports Summer Camp. This monthly educational video series was produced pro-bono by Talking Head Studio in 2015 to share the fundamental concepts behind our model in the simplest terms possible--simple enough to fit in two to three minute video.